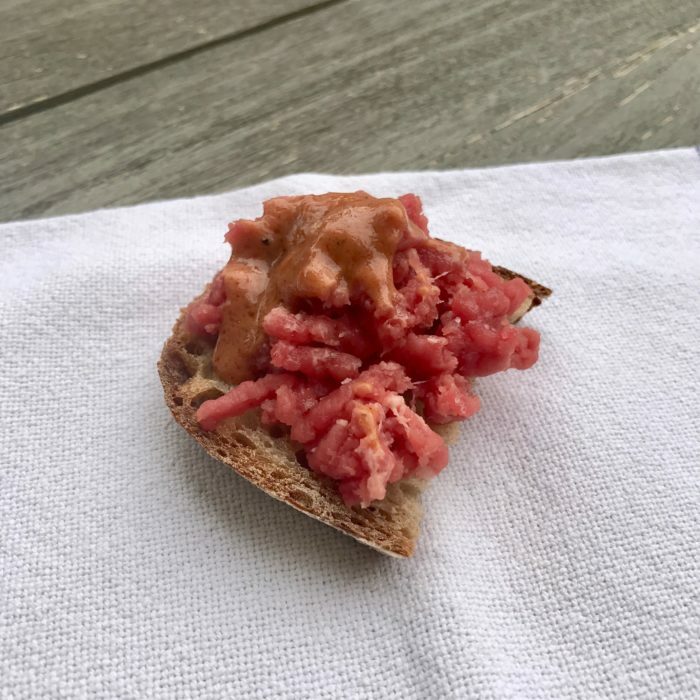 Growing up in Europe, a lot of people eat raw meat and enjoy it. I think I had my first tartare when I was about 6 or 7. My mom would make it at home all the time. On special day we would go to this famous restaurant in Brussels called le " Vieux St Martin" in the center of the city ( it is still there today) and have a "American-Frittes", as we say in Belgium. So it is a no brainer for me that my kids would eat raw meat just like when I grew up and they love it. I always make sure to select to freshest meat and most tender part of the beef and eat it the same day! You can either ask your butcher to ground the beef for you or do it yourself at home ( super easy if you have the machine, which I do). Prepare the sauce by mixing ketchup, mustard, english sauce, olive oil, some salt and pepper. The options that I have added here are part of a traditional tartare but my kids like it better more simple so I keep them on the side and add them if I feel like it.